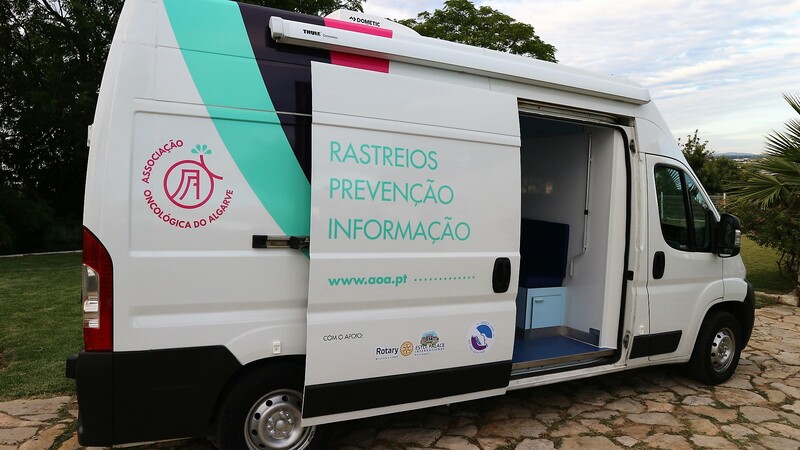 Rotary Club Estoi Palace International (RCEPI) is very proud to be involved in the acquisition of a vehicle that will provide mobile screening for lung and skin cancer throughout the Algarve. This is the first step in a new campaign launched by the Algarve Oncology (AOA) Association “Move-tePelaVida.Algarve” (MoveForYouLife.Algarve). Its purpose is designed to engage with the Algarve population by taking the health services directly to them. This is the way forward to reach a larger number of people and, more importantly, reach those who struggle to access “normal” health services, and to reduce the disparity in social classes accessing health care. 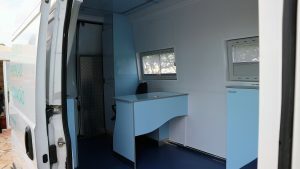 This new mobile Health Unit was delivered to the AOA on June the 30th, during the RCEPI Presidential Handover. The vehicle is the result of a joint effort between Rotary Club Estoi Palace International, the Algarve Oncology Association and the Wolf Valley Charity Fund, totaling € 27,000.00. A joint effort between RCEPI and other Algarve Rotary Clubs will provide the screening equipment. This new campaign aims to educate young people about the long term benefits of a healthy lifestyle and to provide information about cancer, so important to prevent this terrible disease. For the elderly, it is vital to make them aware of early warning signs related to cancer and what to do if cancer is suspected. Again advice will be given on the importance of changing to a healthier life style and diet to improve health generally. This vehicle has been nicknamed ‘Rodinhas / Wheely’ because it is providing ‘health on wheels’ and the Rotary wheel that is the symbol of Rotarians worldwide. It will undertake a “Road Show” throughout the Algarve, educating about healthy lifestyles, advising what to look for to catch any potential life threatening cancer early on and to bring home to people how vital this is. Lung cancer is in the top 3 of deaths caused by cancer so early detection is vital as this improves survival rates immensely. Skin cancer screening is also a priority in the Algarve due to the high exposure of many workers to the sun, particularly those involved in the agriculture and fishing industries. RCEPI has embraced the cause Move-tePelaVida.Algarve – ‘prevention and early diagnose = equals more life and more health’. This is a good example of the Rotary effect in our community!